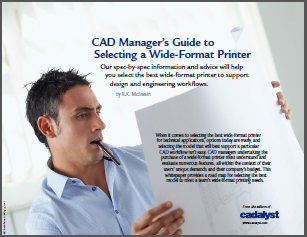 This six-page guide from the editors of Cadalyst lays out spec-by-spec information and advice to help you select the best wide-format printer to support your design and engineering workflow. Despite all the advances in digitizing the design workflow, many projects and workflows today still rely heavily on printed deliverables. Once priced beyond reach of all but the largest companies, wide-format printers today are not only much more affordable than their predecessors, they are also much easier and more cost-effective to operate and maintain. This is leading many firms to purchase or lease wide-format printers for in-house use. When it comes to selecting the best wide-format printer for technical applications, options today are many, and selecting the model that will best support a particular CAD workflow isn’t easy. CAD managers undertaking the purchase of a wide-format printer must understand and evaluate numerous features, all within the context of their users’ unique demands and their company’s budget. In addition to spec-by-spec advice, the guide also includes a list of the wide-format printer companies that offer models for technical applications as well as links to a variety of additional resources to help you make an informed decision.